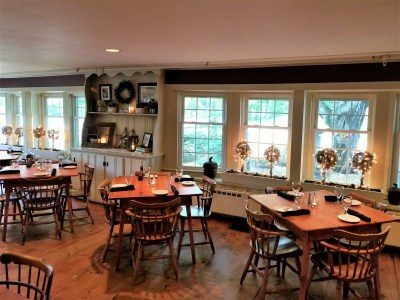 Dining at Christmas Farm Inn and Spa - Jackson NH and Mt. Washington Valley Area Information. Pumpkin People, Tradionally Yours Events, Lodging specials, Dining and Ski Area Info. Seasonal cuisine that reflects the best New England has to offer. We believe that good food is essential to a healthy mind, body and soul. We source available products locally and regionally, and work with quality purveyors to ensure farm-to-table quality and freshness throughout the year. Vegetarian and gluten free options are available and we can cater to most dietary requests if we are informed ahead of time. See our daily specials and enjoy the taste of real food made from scratch and cooked fresh.